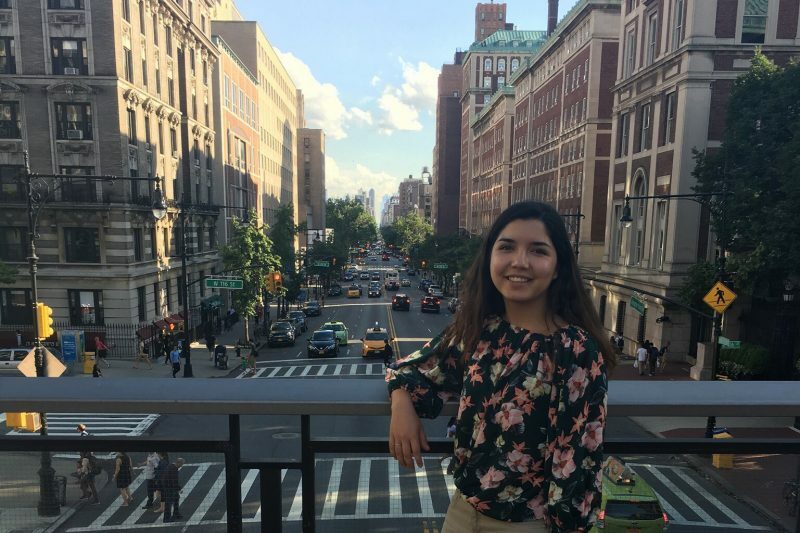 Empowering Youth to Be Leaders Lorena Hernandez Barcena '19 had an eye-opening summer internship with Harlem Children’s Zone, an education nonprofit in New York. This summer, as part of the Shepherd Program, I interned for the Quality Assurance department in Harlem Children’s Zone, an education nonprofit. Harlem Children’s Zone is a ‘pipeline’ organization which sets up a series of programs to support students from before they are born to and through college. These programs range from parenting classes to college application help. I worked mostly with their after-school and summer programs (which emphasized academic, health and arts enrichment) assessing their effectiveness and seeking ways to support the development of their staff. Our goal was to ensure that students were receiving project-based enrichment of the highest quality possible. I researched best practices surrounding project-based and arts education and worked with supervisors to find ways to implement these practices, which allowed me to see the process of translating theory into application. This experience was made possible by the Williams Endowment in the Shepherd Program. What did you enjoy most about the location? I was in New York City, living in central Brooklyn and working in northern Manhattan. I loved the diversity of cultures in the city and the range of activities going on in the city on any given day. I might spend one afternoon exploring Chinatown and Little Italy, then the next walking the High Line Park and going to the Whitney Museum, and the one after hanging out near NYU at a coffee shop. There were always interesting and diverse events; one afternoon I participated in a yoga class with thousands of people in Times Square. Every day could be an adventure. Though there was no such thing as an average day, each morning began with catching up on emails and organizing some paperwork for my supervisor. Then my co-intern and I usually joined one of our supervisors at a training for staff at a program site for a few hours. We came back to the main office for lunch and either worked on a project (such as compiling resources for teachers or creating a flier for an event) or did research on the latest in pedagogy. Then, there might be another meeting in the afternoon with a consultant, an observation of the programming at another site, or a team meeting to check in on the next day’s events. Sometimes the day ended at 5 p.m., and other days we stayed for a meeting of their Youth Advocacy Council, a group of high schoolers who offered their opinions, advice and ideas regarding the Harlem Children’s Zone structure to the adult leaders. I truly enjoyed working with the Youth Advocacy Council. These students range from 14-18 years old and are empowered to make a difference within the organization and at their program sites. When they have an idea on which they agree, they craft a strong argument for it before presenting it to the leadership, and have been able to implement significant changes. It was wonderful to see the organization empowering youth to be the leaders of their own programs, and the youth were very innovative and articulate with their ideas. Being a part of that effort was an honor. It was very hard living on the stipend at the poverty line. My internship was a Shepherd Internship through the Shepherd Higher Education Consortium on Poverty, which gave us a food/activities stipend of $14 per day. This meant that I put a lot of time and energy into researching free and low-cost activities in the city, as well as spending a lot of time cooking. Who served as a mentor to you this summer, and what was the best thing they taught you? The three extraordinarily talented, knowledgeable and experienced women who served as my supervisors were great mentors. Each of them came from a very different background, including social work, startups, and creating nonprofit organizations, and each brought different strengths and passions to the program. They taught me how to be constantly motivated and always strive for better, more impactful service, even within a nationally renowned program like Harlem Children’s Zone. They believe so emphatically in equal opportunity and they embody the values of kindness, empathy and hard work despite exhaustion and occasional frustrations. What have you learned at W&L that helped you in this endeavor, and what will you bring back to your life on campus? I spent a significant amount of time conducting research, which has been a requirement of almost every class I’ve ever taken at W&L. Time management and work ethic were also important tools in the projects I completed independently from my supervisors. Although the concept is not completely new to me, I will return to W&L with a passion for excellence and continued improvement. Regardless of their national reputation and extraordinary college placement rate, Harlem Children’s Zone continues to strive to improve, which is part of what makes them an incredible organization. Has this experience impacted your studies or future plans in any way? I have always known that I wanted to work in education in some capacity, but haven’t been sure whether I wanted to work in nonprofit, policy, advocacy, or within the existing systems. This internship reinforced my desire to work for education equality and opened my eyes to the importance and impact of nonprofits. However, this summer I didn’t have many opportunities to work with young people, spending most of my time talking to adult staff. I realized that I dearly missed working with young people, and regardless of what career path I choose, I know that I want it to involve active engagement with youth. This was a concrete, real-world example of a career path I could take. I could visualize my career as a staff member in several different capacities of an organization similar to Harlem Children’s Zone, as the founder or head of such an organization, or within one of their various sites. I thought this was invaluable as I begin to develop plans and ideas for the future, particularly in understanding how complicated the day-to-day operations of an organization as large as Harlem Children’s Zone (which serves more than 12,000 students) could be. Describe your summer adventure in one word.